Aiden John McGeady (born 4 April 1986) is a professional footballer who plays as a winger for EFL League One club Sunderland and the Republic of Ireland national team. He started his career at Scottish Premier League club Celtic – with whom he won four league titles, two Scottish Cups and two Scottish League Cups – before moving to Russian club Spartak Moscow in 2010. In Russia, McGeady was a runner-up in the Russian Premier League. He moved to English football with Everton in January 2014, being loaned to Sheffield Wednesday and Preston North End before joining Sunderland in summer 2017. McGeady was born and brought up in Scotland but chose to play for Ireland, qualifying through his Irish grandparents. He was included in the Irish squads at UEFA Euro 2012 and UEFA Euro 2016. McGeady was born in Rutherglen, Scotland. He attended Trinity High School (Rutherglen) for a short period of time before attending St Ninian's High School, Giffnock. His father, John McGeady, was also a professional footballer for Sheffield United. McGeady began his career with Queen's Park, having played as a child with a local youth team, Busby Boys Club. After several trials with clubs in England, including several visits to Arsenal, he joined Celtic while still in his early teens. He progressed through the academy, playing with the youth and reserve teams, and won the Scottish Youth Cup in 2003. His senior debut was on 24 April 2004 aged 18 in a league game against Hearts at Tynecastle late in the 2003–04 season. He started the match and scored a goal after 17 minutes, and finished that season with four league appearances as Celtic won the league. He made his UEFA Champions League debut the next season in a game against Italian side AC Milan and made the breakthrough into the first-team that same season, with 27 appearances in the league as Celtic finished runners-up in Martin O'Neill's final campaign with the club. He also featured as a late substitute in the season's Scottish Cup Final in which Celtic defeated Dundee United 1–0. McGeady's 2005–06 season was hampered by a persistent knee injury and he struggled to secure a starting place ahead of Shaun Maloney and Shunsuke Nakamura, but still managed to make 19 appearances over the course of the season as Celtic won the league title. The 2006–07 season saw Maloney leave Celtic for Aston Villa in January 2007, giving McGeady an opportunity to secure a regular starting place. He played regularly from that point in the Celtic team that again won the SPL championship and also qualified for the knockout stage of the Champions League for the first time in club history, defeating Manchester United, Benfica and Copenhagen in the group stage before losing 1–0 to eventual champions AC Milan in extra time. McGeady also started the 2007 Scottish Cup Final victory over Dunfermline Athletic. The 2007–08 season was McGeady's annus mirabilis, earning him praise from the media, fans and fellow players. One of his most memorable performances came against Aberdeen, scoring a goal and setting up three, including a second goal for striker Scott McDonald with a 360-degree turn and cross. He continued to provide goals for his team, most importantly McDonald's equalising goal against rivals Rangers, a match that Celtic went on to win 3–2 which proved to be crucial in Celtic's successful defence of their title. Throughout the season, he contributed a total of eight goals and 24 assists and was awarded the SPFA Player of the Year and Young Player of the Year on 20 April 2008, only the second player ever to receive both awards in the same season (the first was Shaun Maloney in 2006), as voted by his fellow players. The club reached the knockout stages of the Champions League for a second consecutive season and won the league title for the third year in a row, overhauling Rangers with one week left and winning at Dundee United on the final day of the season to clinch the trophy. McGeady entered in 2008–09 as Celtic's star player but his performances suffered as Celtic endured a poor second half to the season. On 16 December 2008, after a much-publicised dressing room row with manager Gordon Strachan, McGeady was fined two weeks' wages and suspended for two matches, although Strachan later denied any fall-out between him and McGeady. Although they won the 2009 Scottish League Cup Final, with McGeady one of the scorers, Celtic finished runners-up to Rangers on the final day of the season and Strachan resigned soon after. 2009–10 began well for McGeady as he scored two goals against Aberdeen on the opening day of the season. Under new manager Tony Mowbray, the team's form was poor for much of the campaign, which led to Mowbray being sacked in March. McGeady's form improved, staying injury-free while contributing seven goals and 16 assists in 35 league appearances. Former teammate Neil Lennon took over as interim manager after Mowbray's departure. Ross County knocked Celtic out of the Scottish Cup and Celtic ended the season trophyless for the first time since 2003, having finished in second place in the SPL. In August 2010, McGeady joined Russian side Spartak Moscow signing a four-and-half-year contract. The fee of £9.5 million made McGeady the most expensive export from Scottish football. He made his league debut in September, a 2–1 win against Saturn. He scored his first goal for Spartak in a 2–2 draw at home to Amkar later the same month. In the last game of the season, McGeady was sent off for a late challenge on Marcin Kowalczyk in the derby against Dynamo Moscow. 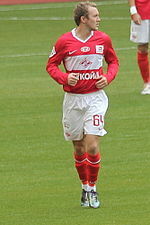 He was included in the Russian Football Union's list of 33 top players, published in December 2010, placing McGeady as second best right winger. The 2011–12 season started with McGeady scoring a late goal against FC Basel, putting Spartak through to the last 16 of the UEFA Europa League. In his first full season he made 31 appearances, scoring three times, but expressed a desire to leave the club once his contract ran out. After starting the 2012–13 season by scoring in a 2–1 win over Volga, McGeady received his first red of that season, getting sent off in a 5–0 defeat to FC Zenit Saint Petersburg on 11 August 2012. Spartak were knocked out of the UEFA Champions League by McGeady's former club, Celtic. In May 2013, McGeady received a red card for the second time in the season after he struck an opponent, and then made an offensive gesture as he left the pitch. He was accused of vandalising a dressing room door at Saransk Stadium and was warned that he could face police action. Originally suspended for six matches, the Russian Football Union reduced his suspension to two matches. After serving the two match ban, he made his return on the last game of the season, where he provided an assist in a 2–0 win against Alania Vladikavkaz. At the end of the season, McGeady made 23 appearances and scored five times. McGeady scored his first goal of 2013–14, also providing an assist, as Spartak won 2–0 against Ural Sverdlovsk Oblast. In September, he had a hat-trick of assists in a 3–2 win over Krasnodar, but he was disciplined, sent to train with the club's youth team, and was later placed on the transfer list after ignoring team orders. Despite being disciplined, manager Valeri Karpin says McGeady can make it back to the first team. In January 2014, McGeady joined English club Everton of the Premier League on a four-and-a-half-year contract for an undisclosed fee. He made his debut by coming on as a substitute in a 1–1 draw away to West Bromwich Albion. McGeady was mainly used as a substitute as he made just three starts in his first season, helping Everton to record their best ever points tally in the Premier League era of 72 to finish fifth. McGeady scored his first goal for Everton on 16 August 2014, curling in the ball in off the post in a 2–2 draw with Leicester City on the opening day of the 2014–15 Premier League season. A knee injury in January 2015 saw McGeady lose his place in the team to Aaron Lennon who signed for Everton during the transfer window that same month. McGeady only featured twice for Everton for the rest of the season, making two late second-half substitute appearances in May 2015. The start of the following season saw McGeady completely frozen out of the Everton first team. By November 2015 he had made only one appearance, in a League Cup tie against Barnsley on 26 August, and even then he was taken off at half-time. McGeady was not assigned a squad number for the 2016–17 season. On 1 February 2016, McGeady signed for Sheffield Wednesday on loan for the remainder of the 2015–16 season, with manager Carlos Carvalhal stating that he had attempted to sign McGeady while managing Sporting Lisbon. McGeady scored his first goal for Sheffield Wednesday in a 3–0 win at Nottingham Forest on 12 March 2016. McGeady was left out of Carvalhal's squads for both legs of the playoff semi-final against Brighton and the playoff final against Hull after a series of poor performances. On 31 August 2016, McGeady signed for Preston North End on a season-long loan. Playing regularly appeared to help McGeady recover some of his best form and he was awarded the Championship Player of the Month for February after scoring three goals and providing four assists. After scoring eight goals in 35 appearances during his stint at Deepdale, he was named as Preston's player of the year. McGeady signed a three-year contract with Sunderland on 13 July 2017, reuniting him with former Preston manager Simon Grayson. He made his debut on 4 August 2017, in a 1–1 draw with Derby County. McGeady scored his first goal for Sunderland the following weekend on 13 August 2017 in a 3–1 victory at Norwich City with a "superb strike" from 20 yards, then set up Lewis Grabban for his second goal and Sunderland's third with a cross. McGeady played for Scotland Schools while at Queen's Park. He played in an under-13 World Cup tournament in Paris. After Queen's Park he joined Celtic, who had a policy of not permitting their youths to play for their school teams due to conflicting kick off times. Scotland had a rule which would not permit a player who did not play for their school team to be considered for a call-up to Scotland Schools selects. The Republic of Ireland had no such rule preventing a player from being selected and instructed Donegal-born former Celtic player Packie Bonner, who knew of McGeady's Irish heritage, to invite McGeady to play for the Republic of Ireland Under-15 Schoolboys team. McGeady qualifies for Ireland through his paternal grandparents, who hail from the Gaeltacht area of Gweedore, County Donegal. McGeady accepted the offer and joined the Irish youth setup. McGeady was later named in a Scotland under-16 squad but declined the invitation, citing his experience of the Irish set-up, despite attempts to persuade him to do so by Scotland head coach Berti Vogts. This decision led to jeering from fans of other Scottish clubs, particularly Rangers supporters who referred to him as "that wee traitor from Castlemilk" in the controversial Famine song. McGeady made his full debut for the Republic of Ireland in July 2004 against Jamaica. He has made over 80 appearances for Ireland and featured often under manager Giovanni Trapattoni, appearing in each of his squads. However, he lost his place in the starting line-up during the 2010 World Cup qualifiers. McGeady in action for the Republic of Ireland against Poland, November 2013. On 26 March 2011, McGeady scored his first goal for Ireland in the Aviva Stadium against Macedonia in Euro 2012 qualifier, with Ireland winning 2–1. On 7 October 2011, McGeady scored his second international goal against Andorra thanks to a deflection off the Andorra defender to make the game 2–0. In the first leg of the UEFA Euro 2012 play-off against Estonia, McGeady provided the assist for the first goal when his cross found the head of Keith Andrews who scored. The game finished 4–0 to Ireland. McGeady was named in Trapattoni's 23-man squad for the 2012 European Championships in Poland and Ukraine. McGeady set up Ireland's first and only goal of the tournament from a free-kick, converted by Leicester City's Sean St Ledger in the 3–1 defeat to Croatia. In Martin O'Neill's first game as Irish manager, he scored his first international goal for over two years in a 3–0 win over Latvia. In September 2014, McGeady scored both of Ireland's goals against Georgia in a 2–1 away victory in the opening game of the Euro 2016 qualifiers. Despite having made only 13 appearances at club level in the preceding season, he was selected for the Ireland squad for the finals tournament, and appeared as a substitute in each of the three group games (a draw with Sweden, a defeat to Belgium and a win over Italy). A two-footed player, McGeady is known for his speed, skill, and creativity with the ball on the wing, as well as his dribbling skills, technique, close control, ball playing ability, and use of feints and trickery in possession. When facing opponents in one on one situations, he is known for using a variation upon the marseille turn (popularised by Zinedine Zidane), which includes him dragging the ball with his right foot behind his standing foot – instead of to the side – during the first phase of the move, in a similar manner to the Cruyff Turn. The third phase also sees him using the outside of his left boot to move the ball in instead of the sole. This trademark move of his has come to be known as the McGeady Spin in his honour, and has been included in EA Sports' FIFA video game series. ^ "Premier League Clubs submit Squad Lists" (PDF). Premier League. 4 February 2014. p. 12. Archived from the original (PDF) on 16 March 2014. Retrieved 9 February 2014. ^ a b McGuirk, Brian (2013). Celtic FC – the Ireland Connection. Black & White Publishing. ISBN 9781845026301. ^ "Player Profile". www.SpartakMoscow.com. Retrieved 30 July 2013. ^ "Scottish talent with an Irish allegiance". The Irish Abroad. 12 October 2004. Archived from the original on 12 October 2004. ^ "Hooray for Holyrood!". Evening Times. 6 February 2012. Retrieved 15 January 2014. ^ a b c d "The Big Interview: Aiden McGeady". The Times. 1 May 2005. Retrieved 22 September 2017. ^ a b "Players – Aiden McGeady". Everton FC. Retrieved 25 November 2015. ^ "Hearts 1–1 Celtic". BBC. 25 April 2004. Retrieved 12 January 2014. ^ "Games played by Aiden McGeady in 2003/2004". Soccerbase. Centurycomm. Retrieved 12 January 2014. ^ "Celtic 1–0 Dundee United". BBC Sport. 28 May 2005. Retrieved 22 September 2017. ^ "McLeish: "Celtic deserved title"". BBC Sport. 6 April 2006. Retrieved 22 September 2017. ^ "Celtic foiled by Kaká magic". UEFA. 8 March 2007. Retrieved 22 September 2017. ^ "Celtic 1–0 Dunfermline". BBC Sport. BBC. 26 May 2007. Retrieved 9 November 2015. ^ "Even Nakamura is fearing for his place now that Celtic have genuine strength in depth". Daily Mail. 12 February 2008. Retrieved 22 September 2017. ^ "Celtic 3–2 Rangers – as it happened". The Guardian. 27 April 2008. Retrieved 22 September 2017. ^ "Two for Messi as Barça see off Celtic". UEFA. 21 February 2008. Retrieved 22 September 2017. ^ "Dundee United 0–1 Celtic". BBC Sport. 22 May 2008. Archived from the original on 26 May 2008. Retrieved 22 September 2017. ^ "Aberdeen's League Cup hero Barry Robson: I've not felt like this since we won the title for Tommy Burns at Celtic". The Daily Record. 18 March 2014. Retrieved 22 September 2017. ^ Murray, Ewan (11 May 2009). "Gordon Strachan denies playing personality games with Celtic team selection". London: The Guardian. Retrieved 23 April 2010. ^ "Celtic 2–0 Rangers". BBC. Retrieved 22 September 2017. ^ "Celtic end manager Tony Mowbray's troubled reign". BBC Sport. 25 March 2010. Retrieved 22 September 2017. ^ "Neil Lennon slams the lack of Celtic hunger and desire". BBC Sport. 10 April 2010. Retrieved 22 September 2017. ^ "Celtic's Aiden McGeady returns from Spartak talks". BBC Sport. 5 August 2010. Archived from the original on 19 August 2010. Retrieved 13 August 2010. ^ a b "Aiden McGeady completes record move to Spartak Moscow". BBC Sport. 13 August 2010. Archived from the original on 13 August 2010. Retrieved 13 August 2010. ^ "McGeady delighted after setting up winner on debut for Spartak". The Scotsman. 13 September 2010. ^ "Aiden McGeady shows stomach for first Spartak goal". The Scotsman. 25 September 2010. ^ "Video: Red mist descends on Aiden McGeady in Moscow derby". STV Sport. 29 November 2010. ^ "33 ЛУЧШИХ ФУТБОЛИСТА РОССИИ 2010 – Российский Футбольный Союз" (in Russian). Russian Football Union. Archived from the original on 28 July 2011. ^ "Spartak shake off Basel revival". UEFA.com. 24 February 2011. Archived from the original on 26 February 2011. Retrieved 1 February 2014. ^ "McGeady wants to leave "Spartacus" after the contract" [Макгиди намерен покинуть "Спартак" после окончания контракта] (in Russian). Chempionat.com. 22 May 2012. Retrieved 1 February 2014. ^ "Zenit 5–0 Spartak Moscow". Yahoo! Eurosport. 11 August 2012. Archived from the original on 24 February 2014. Retrieved 1 February 2014. ^ "Aiden McGeady impressed by former club Celtic". BBC Sport. 4 December 2012. Retrieved 1 February 2014. ^ "McGeady scores and gets sent-off as Spartak's European hopes fade". Irish Independent. 3 May 2013. Retrieved 1 February 2014. ^ "Aiden McGeady accused of trashing dressing room following red card". Sport STV. 7 May 2013. Retrieved 1 February 2014. ^ "Ireland's Aiden McGeady given six-game Spartak Moscow ban". BBC Sport. 8 May 2013. Retrieved 31 January 2014. ^ "Appeals Committee overturned the disqualification shestimatchevuyu McGeady" [Апелляционный комитет отменил шестиматчевую дисквалификацию Макгиди] (in Russian). Chempionat.com. 22 May 2013. Retrieved 1 February 2014. ^ "Spartak Moscow discipline Aiden McGeady for disobeying team orders". Sky Sports. 2 December 2013. Retrieved 1 February 2014. ^ "Aiden McGeady could play for Spartak Moscow again". BBC Sport. 2 December 2013. Retrieved 1 February 2014. ^ "Aiden McGeady joins Everton from Spartak Moscow". RTÉ. 11 January 2014. ^ "West Bromwich Albion 1–1 Everton". BBC Sport. 20 January 2014. Retrieved 31 January 2014. ^ "Hull City 0–2 Everton". Sports Mole. Retrieved 26 May 2014. ^ "Aiden McGeady with majestic strike but Chris Wood earns a point for Leicester". Irish Independent. 16 August 2014. Retrieved 16 August 2014. ^ "Aiden McGeady needs to put Everton woes behind him and concentrate on helping Ireland beat Poland, insists Martin O'Neill". Daily Record. 28 March 2015. Archived from the original on 26 November 2015. Retrieved 25 November 2015. ^ a b "Adien McGeady". Soccerbase. Retrieved 30 May 2014. ^ Kelly, Ryan (16 September 2015). "From hero to zero – Aiden McGeady must move for the sake of his Ireland career". Goal. Retrieved 25 November 2015. ^ "Premier League 2016–17 Preview Everton". The Guardian. 3 August 2016. ^ "Bringing quality to the team". ^ "Nottm Forest 0–3 Sheff Wed". BBC Sport. BBC. 12 March 2016. Retrieved 12 March 2016. ^ Walker, Mark (24 May 2016). "Former Celtic star Aiden McGeady axed from Sheffield Wednesday squad for Play-Off final". The Herald. Glasgow. Retrieved 23 June 2016. ^ "Aiden McGeady Joins On Season Loan". PNEFC. 31 August 2016. ^ "'I'm proud to be his manager' – McGeady named Championship player of the month". The 42. 6 April 2017. ^ a b "Aiden McGeady Wins 2017 Sir Tom Finney Player Of The Year Award". Preston North End F.C. 30 April 2017. ^ "James Vaughan & Aiden McGeady: Black Cats sign Bury striker and Preston winger". BBC Sport. 13 July 2016. Retrieved 13 July 2016. ^ "Sunderland 1–1 Derby County – BBC Sport". BBC Sport. 4 August 2017. Retrieved 13 August 2017. ^ "Norwich City 1–3 Sunderland – BBC Sport". BBC Sport. 13 August 2017. Retrieved 13 August 2017. ^ a b "Who's to blame in sorry tale of the one that got away?". Sunday Herald. 2 May 2004. Archived from the original on 19 August 2009. ^ St Anthony (12 November 2011). "Well Done Aiden McGeady". celticunderground. Retrieved 3 June 2012. Aiden with dual Scots-Irish nationality and had we became professional footballers we would have had a similarly difficult decision to make. ^ "The Racist Famine song". ^ "McGeady furthers his footballing education". Irish Independent. 22 August 2010. Retrieved 22 August 2010. ^ "Rep of Ireland 2–1 Macedonia". BBC Sport. 26 March 2010. Retrieved 29 March 2011. ^ "Republic on course for Euro 2012". skysports.com. SkySports. 7 October 2011. Archived from the original on 25 October 2011. ^ Hytner, David (12 November 2011). "Republic of Ireland on verge of Euro 2012 as Keane helps thrash Estonia". guardian.co.uk. London. ^ "Euro 2012 squad". irishtimes.com. 8 May 2012. ^ Phillips, Owen (10 June 2012). "Euro 2012: Republic of Ireland 1–3 Croatia". BBC Sport. Retrieved 7 September 2014. ^ "Republic of Ireland 3–0 Latvia". BBC Sport. 15 November 2013. ^ Quinn, Philip (7 September 2013). "Georgia 1–2 Republic of Ireland: Aiden McGeady scores twice as Martin O'Neill's men secure late win in first Euro 2016 qualifier". Mail Online. Retrieved 7 September 2014. ^ "Euro 2016: Republic of Ireland captain Robbie Keane selected". BBC Sport. 31 May 2016. Retrieved 29 September 2017. ^ Diallo, Raf. "Why is Aiden McGeady thriving at Spartak Moscow?". www.newstalk.ie. Retrieved 30 July 2013. ^ Doyle, Paul (12 June 2015). "Enigma of Aiden McGeady to tease Ireland fans once more against Scotland". The Guardian. Retrieved 22 February 2019. ^ Yokhin, Michael (1 April 2012). "From Russia without love - Aiden McGeady faces uncertain future as Spartak Moscow adventure goes sour". Goal.com. Retrieved 22 February 2019. ^ Grahame, Ewing (29 July 2009). "Aiden McGeady is like Wayne Rooney, says Celtic manager Tony Mowbray". The Telegraph. Retrieved 22 February 2019. ^ Grahame, Ewing (22 April 2008). "Aiden McGeady: 'No favours for Rangers'". The Telegraph. Retrieved 22 February 2019. ^ "Ribery and Aiden Mcgeady skill spin compilation". YouTube. 4 September 2008. Retrieved 7 April 2007. ^ Williams, Tom (9 May 2018). "The Joy of Six: football moves named after players". The Guardian. Retrieved 22 February 2019. ^ "Games played by Aiden McGeady in 2003/2004". Soccerbase. Centurycomm. Retrieved 30 October 2018. ^ "Games played by Aiden McGeady in 2004/2005". Soccerbase. Centurycomm. Retrieved 30 October 2018. ^ "Games played by Aiden McGeady in 2005/2006". Soccerbase. Centurycomm. Retrieved 30 October 2018. ^ "Games played by Aiden McGeady in 2006/2007". Soccerbase. Centurycomm. Retrieved 30 October 2018. ^ "Games played by Aiden McGeady in 2007/2008". Soccerbase. Centurycomm. Retrieved 30 October 2018. ^ "Games played by Aiden McGeady in 2008/2009". Soccerbase. Centurycomm. Retrieved 30 October 2018. ^ "Games played by Aiden McGeady in 2009/2010". Soccerbase. Centurycomm. Retrieved 30 October 2018. ^ a b c d Aiden McGeady at Soccerway. Retrieved 30 October 2018. ^ "Games played by Aiden McGeady in 2013/2014". Soccerbase. Centurycomm. Retrieved 30 October 2018. ^ "Games played by Aiden McGeady in 2014/2015". Soccerbase. Centurycomm. Retrieved 30 October 2018. ^ a b "Games played by Aiden McGeady in 2015/2016". Soccerbase. Centurycomm. Retrieved 30 October 2018. ^ a b "Games played by Aiden McGeady in 2016/2017". Soccerbase. Centurycomm. Retrieved 30 October 2018. ^ "Games played by Aiden McGeady in 2017/2018". Soccerbase. Centurycomm. Retrieved 30 October 2018. ^ "Games played by Aiden McGeady in 2018/2019". Soccerbase. Centurycomm. Retrieved 12 January 2019. ^ "Football PLAYER: Aiden McGeady". EU-Football.info. Retrieved 23 June 2016. ^ "McGeady wins PFA award". Sunderland Association Football Club. 7 March 2019. Retrieved 7 March 2019. Wikimedia Commons has media related to Aiden McGeady.